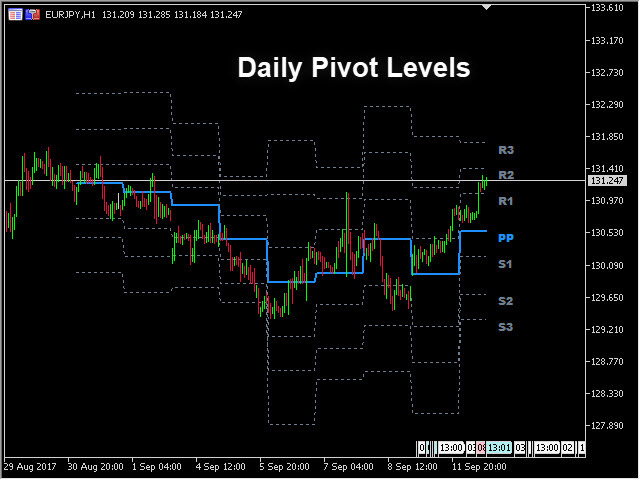 PipTick Pivot indicator automatically calculates and displays pivot point line and levels of the support and resistance. 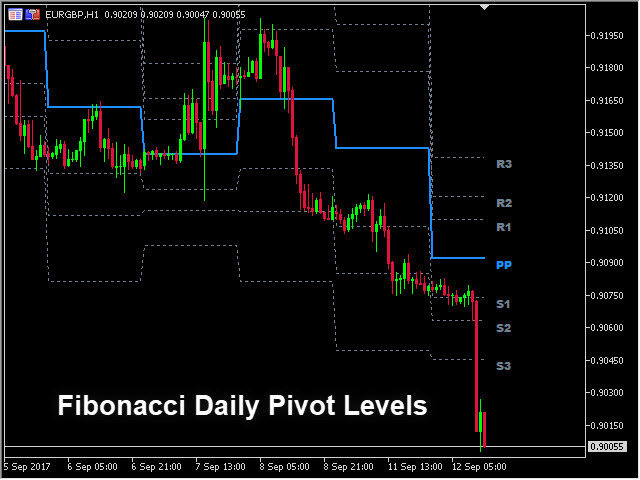 Pivot can be calculated according to the Classic, Floor, Fibonacci, Woodie, Camarilla or DeMark formula. It is also possible to select the period for calculation of the indicator. Trader can choose from daily, weekly, monthly, or user-defined period. 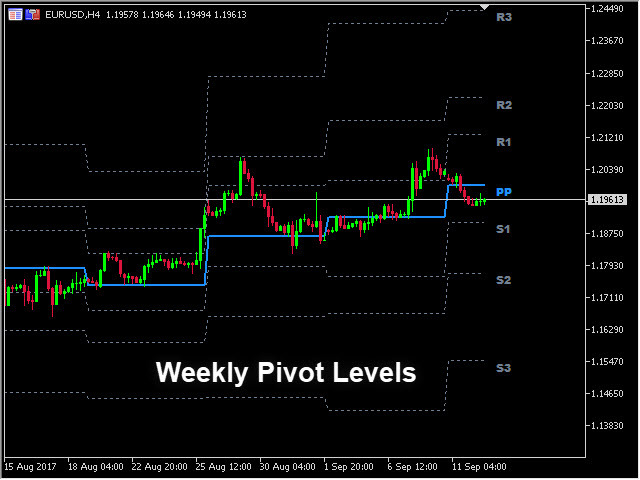 The indicator shows current and historical pivot point level. 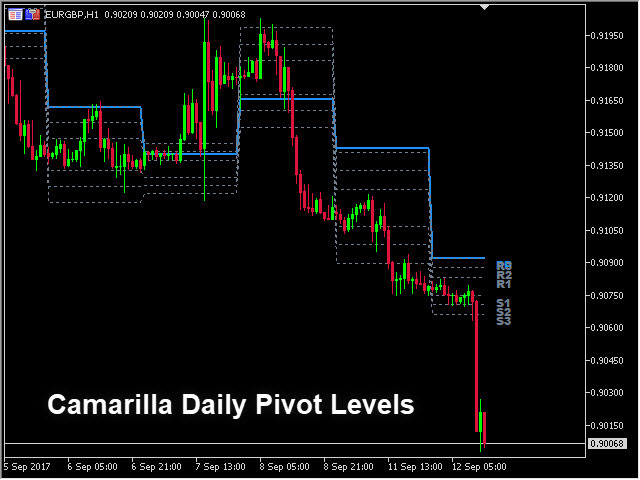 Pivot support and resistance levels. 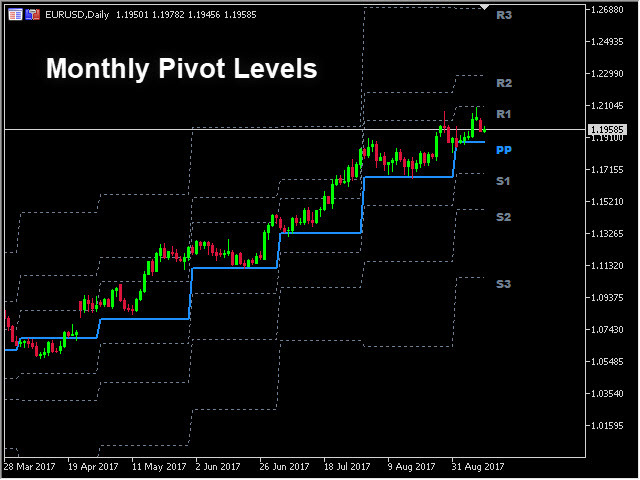 Pivot_Method - Allows to choose between Classic, Floor, Fibonacci, Woodie, Camarilla or DeMark formula for calculation of the indicator. Session_Mode - Allows to choose between Daily, Weekly, Monthly and Custom Session mode. 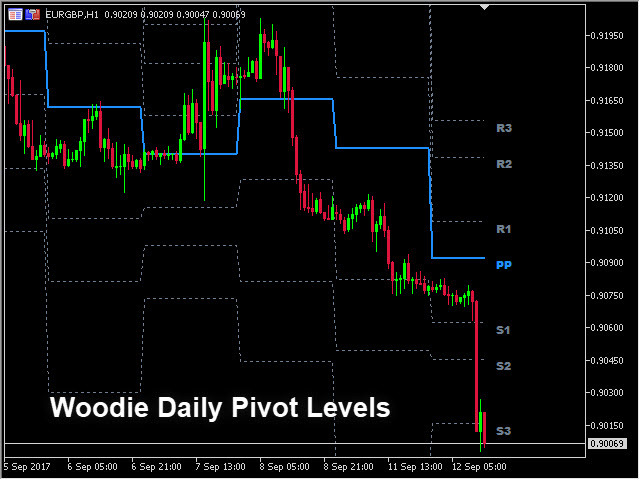 Visibility_PP - Allows to enable or disable displaying of the pivot point line. Visibility_R1 - Allows to enable or disable displaying of the first resistance line. Visibility_R2 - Allows to enable or disable displaying of the second resistance line. Visibility_R3 - Allows to enable or disable displaying of the third resistance line. Visibility_S1 - Allows to enable or disable displaying of the first support line. Visibility_S2 - Allows to enable or disable displaying of the second support line. 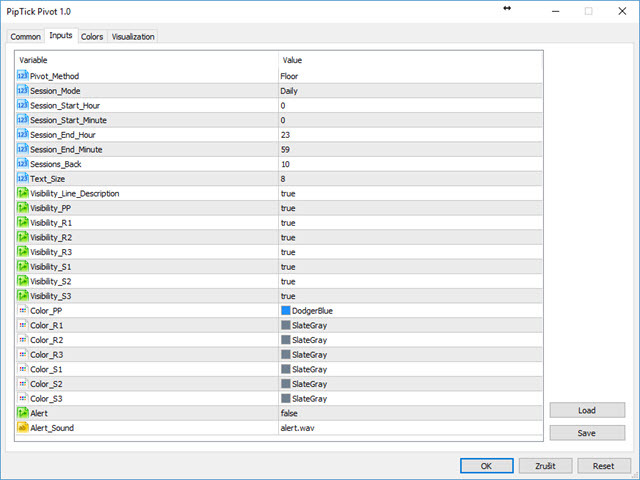 Visibility_S3 - Allows to enable or disable displaying of the third support line. Color_PP - Color of the pivot point line. Color_R1 - Color of the first resistance line. Color_R2 - Color of the second resistance line. Color_R3 - Color of the third resistance line. Color_S1 - Color of the first support line. Color_S2 - Color of the second support line. Color_S3 - Color of the third support line. 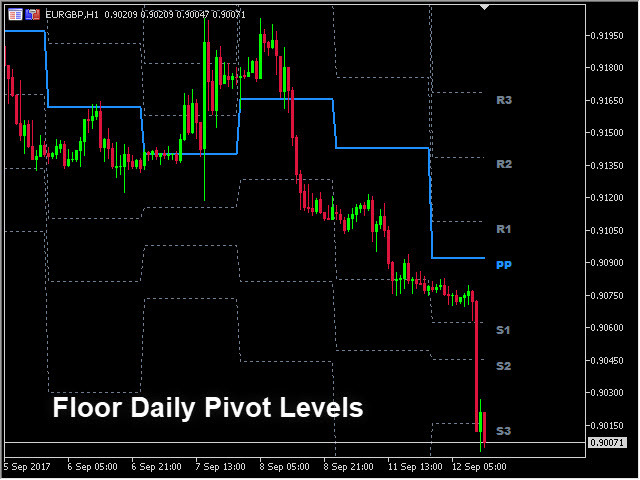 PP - Value of the pivot point. 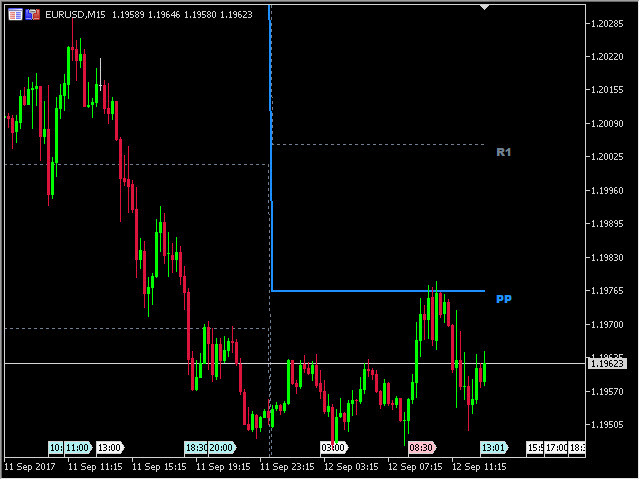 R1 - Value of the first resistance. R2 - Value of the second resistance. 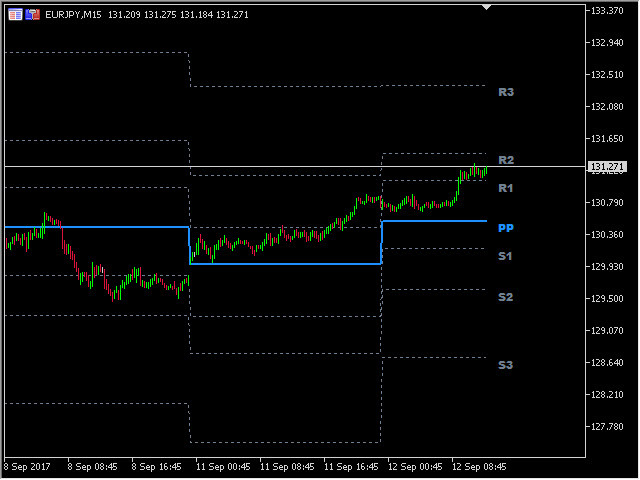 R3 - Value of the third resistance. S1 - Value of the first support. S2 - Value of the second support. S3 - Value of the third support.